Discussion in 'Model X' started by pvogel, Dec 24, 2015. Digit 4: Line/Series (S/X, I'll assume Model III will be "E"
Digit 7: Unclear, no match to what's shown in the Wiki, my P90D has an "E" here. Digit 10: Model year, F=2015, the X probably starts at G=2016, mine is a "G"
Digit 11: Manufacture location: F=Fremont, anyone know the european location code? Digit 13-17: Production sequence last 5 digits. Digit 8 - we have a "4" but do not have Ludicrous in our P90D. Digit 9 - we have a zero, but I have no explanation why. Digit 10 - we have a "G" and since it's a Production reservation we'll be getting it in 2016. Digit 12 - we have a zero, so presumably first round of Production up to 99,999. 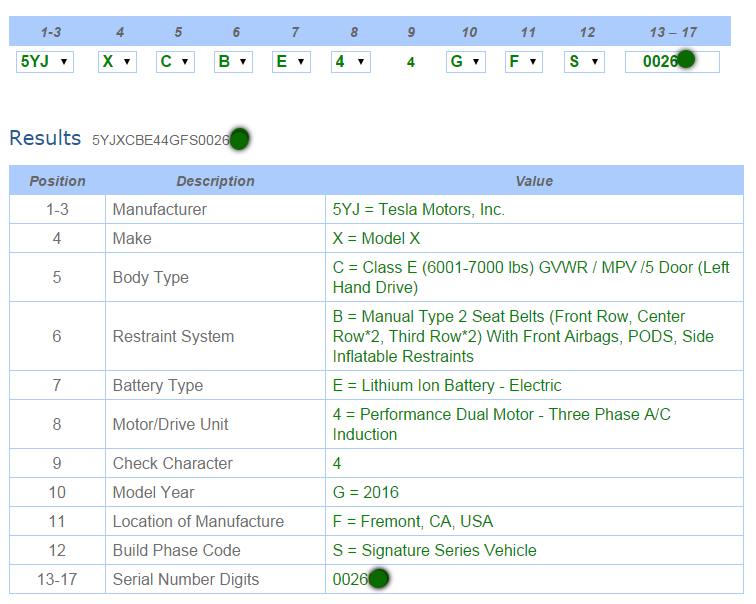 Digits 13-17 - we have 003xx, so I guess that means our P90D will be the 3xxth Production built? In case it helps decode more, we ordered a P90D, no Ludicrous, standard wheels, Midnight Silver Metallic, Ultra White Seats, Figured Ash Wood Décor, Black Headliner, Seven Seat Interior, AutoPilot, Premium Upgrades Package, and Ultra High Fidelity Sound. Our reservation number was 50xx, made in August 2013. We're taking delivery in California.